The Hive Gym in Versova offers indoor bouldering, trampoline workouts and other cardio workout sessions for anyone who is looking to get fit and in shape in 2017. The Hive Gym is an all encapsulating gym offering up some high intensity workout sessions. They focus more on unconventional training, therefore, one can expect fitness routines that are designed around the natural movement of the body. Not just that, the gym is equipped with a trampoline, an indoor bouldering wall, cross training and other equipment needed for cardio training as well. The trainers work together to help you with your diet, the workouts you should sign on and work to strengthen your core, coordination and stability. If you are not super into gym equipments, and prefer a natural way of working out, then we suggest get a membership here. They have a small wall for indoor bouldering, for you to climb and intensely workout. 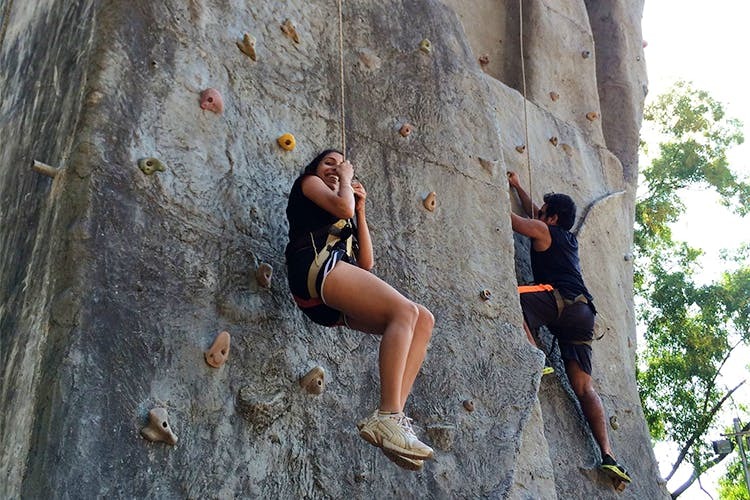 Instead of scaling the natural rocks, they’ll let you scale the indoor wall for getting fit and strong. The trainers will also devise a nutrition plan for you in addition to to engaging you in regular workouts like the on-the spot drills, trampoline workouts and more. For a month, the membership cost you INR 4,465. However, you can also go for a trail session for INR 300. If you live in and around Andheri, then The Hive gym is a fitting workout space for you to join.